The Monte Vista Athletic Boosters (“MVAB”) Scholarship-Award program recognizes and rewards Monte Vista High School student-athletes who demonstrate excellence through athletic participation, academic achievement, and service to Monte Vista High School. 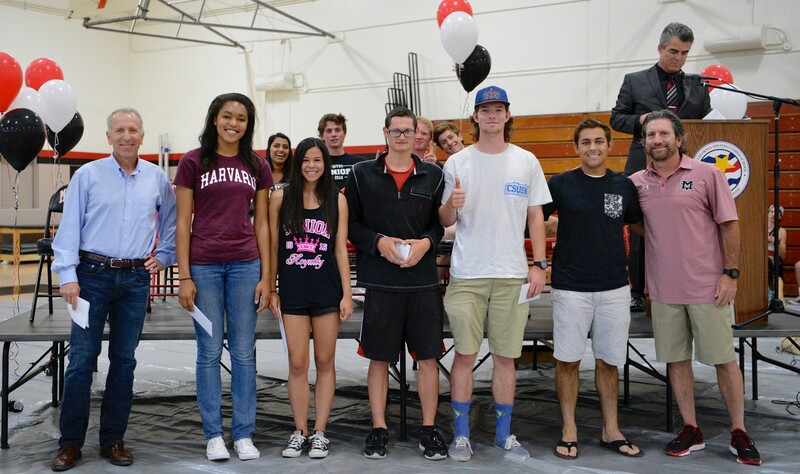 Six $1,000 scholarships were awarded to 3 girls and 3 boys during the Senior Awards Rally held at the school on May 27, 2016. The recipients are listed below. Maclaine helped lead the MV girls volleyball team to back-to-back NCS Championships, was named 1st team EBAL and an Academic All-American this past season. In addition to her many academic accomplishments (4.29 weighted GPA; NHS) she was active in the East Bay Youth Action Council and a volunteer at the Hospice of the East Bay. Maclaine will attend Harvard University next year where she will play volleyball and intends to major in molecular and cellular biology. Anne was a dual-sport athlete for MVHS, helping the Mustangs to the EBAL Championship in soccer her junior year, and was a setter and defensive specialist on MV’s 2-time NCS Champion volleyball team. While balancing the rigors of being a 2-sport athlete, Anne tackled a highly-challenging course load yet achieved a weighted GPA of 4.04. Next Fall Anne will attend UC Santa Barbara. Brooke was a 4-year varsity athlete on both the cross country and track & field teams, leading MV’s cross country to 3 consecutive NCS Championships. An accomplished distance runner, Brooke owns school records in the 1600m and 3200m events and was individual NCS Champion multiple times during her career. In addition to focusing on her academics (4.45 weighted GPA) Brooke was a member of MV’s orchestra and was a tutor for math and violin. Brooke is taking her talents to Harvard University next year, where she will be a member of both the track and cross country teams. Jake was a 4-year varsity member of MV’s swim team, where he was a top butterflyer and NCS finalist for the past 3 years. Jake also holds the school record in the 200 yd Individual Medley. Outside the pool, Jake excelled in the classroom, achieving a weighted GPA of 4.37. For the past three years, Jake was a volunteer math tutor for middle school students. Next Fall, Jake will attend UC San Diego and aspires to a career in biotechnology. Ryan played baseball for MV all 4-years, earning 2 varsity letters along the way and helping the Mustangs to the EBAL Championship in 2015. In addition, he played football his freshman year, where he was team captain. Off the field Ryan excelled in the classroom and was a volunteer for Winter Wonderland for Orphans. Next Fall Ryan will attend and play baseball at Cal State San Marcos. A 4-year member of Monte Vista’s baseball program, Dawson helped lead the Mustangs to the EBAL title in 2015. He has also been a member of the Academic Scholar team for 3 years and earned a weighted GPA of 3.52. Next year Dawson will attend TCU where he hopes to pursue a degree in Economics.